6 Piece Egyptian Quality Premier Collection Bed Sheet Set is designed for an exceptional softness comes in a wide range of colors, perfect for any bedroom decor. Odor and allergy resistant and made of the finest environmentally sustainable materials, these sheets offer the ultimate in luxury and buttery softness. Use of quality 1800 count of Highest Quality Brushed Microfiber lends it softness, durability, and an even surface throughout every wash. The solid pattern of this bed sheet complements the sateen finish lending it a classic appeal. The provision of deep pockets and elastic edges makes it easy to drape this bed sheet over the thickest of mattresses and keep them tucked in. 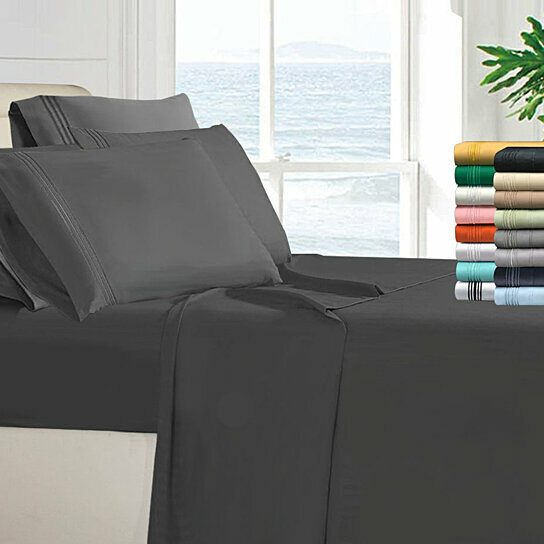 This 6 Piece Egyptian Sheet Set will turn your bedroom into an opulent retreat, keeping you comfortable all night long with superior moisture-wicking properties for superior temperature control.